When the joys of cycling take a turn…into something else. Bicycling has been rising in popularity, and sadly, so have accidents. For many people, riding their bike is a deeply meaningful part of their day, while for others, it has simply become their main source of transportation. Whatever a person’s reason may be for riding a bike, safety for the well-being of the cyclist as well as for the individuals in large, dangerous vehicles is crucial. Unfortunately, even if a person is mindful and takes all necessary precautions, serious accidents still occur due to irresponsible or careless motor vehicle drivers, a malfunction of the bike, or road conditions. When this happens, cyclists and their loved ones need guidance and assistance to get their lives back on track. Most cyclists are familiar with the safety protocol: wear a helmet, wear bright clothing, go with the flow of traffic, don’t drive on sidewalks, follow traffic laws such as don’t pass on the right, stay alert, and look out for parked cars and pedestrians. Indeed, these are all crucial. Yes, even the helmet is important for all ages. According to the Insurance Institute for Highway Safety Highway Loss Data Institute, head injuries are a major cause of cyclist death, and a helmet can reduce the risk of injury by 50%. It must also be said that a helmet is not completely foolproof, by any means, and of course, a helmet does nothing to prevent the accident in the first place. 17% of all fatal bike accidents included a cyclist wearing a helmet. Sadly, the latest (2015) report from the National Highway Traffic Safety Administration (NHTSA) tells us that the number of cyclists killed in an accident with someone in a moving vehicle went up by 12.2% from the year before. At night, there are a few additional safety measures to take. If you enjoy riding during this time, you really need a front headlight for your own ability to see, but also for better visibility for other drivers to see you. Also , if you can wear some kind of reflective item, this will also help ensure that drivers can see you and let you enjoy your 2-wheel journey in peace. Regardless of all efforts made to be careful, encounters with oblivious drivers are not uncommon. Cyclists can be struck by the passenger side mirror of a vehicle, or get into an accident from a “close call” if they are not directly hit by the vehicle. Sometimes the accidents also occur due to drivers poorly maneuvering in poor weather conditions. Sadly, there are also some individuals that choose to be aggressive and even hateful to cyclists. There are too many stories from cyclists that have had to deal with these types of situations. In fact, some cyclists have decided to wear a camera on their person, and the videos from these cameras has indeed helped them to prove that the driver was at fault. What should a cyclist do when a driver causes them harm? First, if the accident was severe, call 911 and GET MEDICAL ATTENTION. DO NOT DECLINE MEDICAL ATTENTION. This is important for a variety of reasons, but most importantly because internal injuries do not always show how critical they are right after an accident. Third, gather as much information as you can from the scene. You will want the name, contact, and insurance information of the driver. Also note the make, model, and license place of their car, note the location of the accident, traffic conditions, road work, and the weather. Also, take photos and talk to witnesses if able. Be sure to get the witnesses’ information as well. Fourth, DO NOT FIX YOUR BIKE. It needs to stay in the condition it is in so that it can serve as evidence. Keep any other physical evidence, such as clothing, gear and a helmet, if worn. Also, note all of the crucial details regarding what happened, when, with who, and how it came to be. ASK A LAWYER (preferably one with experience and dedicated knowledge to bicycle accidents) to help you before you begin talking to any insurance companies (yours, the driver’s, or anyone else involved). This is for your protection so that you are not wrongfully blamed. If you are concerned about cost, please know that many lawyers are willing to work on a contingency basis, so their payment would simply come from the settlement. Many lawyers also offer free consultations. What if a Cyclist Accident Was Not Caused by a Driver? If your accident did not involve a driver, it is absolutely worthwhile to ask a lawyer for help. You may be able to make a claim on your own insurance policy, including an underinsured/uninsured (UM/UIM) policy. Further, there still might be a responsible party to the accident, such as a faulty road condition that should have been fixed or a defective bicycle or part. As most personal injury and accident lawyers offer free consultations, there is no reason to not seek legal help. A claim of negligence must be made in order to determine who is at fault. It is important to know that both sides of this suit will be required to prove that they were not “careless” and that they did, in fact, exercise a “reasonable” standard of care up to and during the incident. Depending on state law, “negligence” maybe evaluated as contributory negligence or comparative negligence, which is more common. Contributory Negligence: Beware that a defendant can claim contributory negligence against the plaintiff, even if the defendant was determined to be the one at fault. For example, if a car struck you, and even if this is proven in a lawsuit, it is still possible for the person in the car to claim that the cyclist committed contributory negligence. 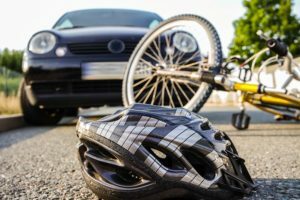 If it is determined that the cyclist did, in fact, contribute to the accident as well, then the damages that were due to the plaintiff can be reduced or barred completely. Comparative Negligence: This is an approach that many states use to determine charges in a lawsuit in an effort to be as fair as possible. Each party is examined to determine their level of negligence in this case. The most common approach to this is a “Modified” approach, where the plaintiff will not recover any damages if they are found to be 50% or more responsible for the accident. Another approach that some use is “Pure” to reduce a plaintiff’s recovered damages by the determined percentage of their negligence committed towards the cause of the accident.